Smaller homes are big news – keeping things efficient and economical is definitely on trend. 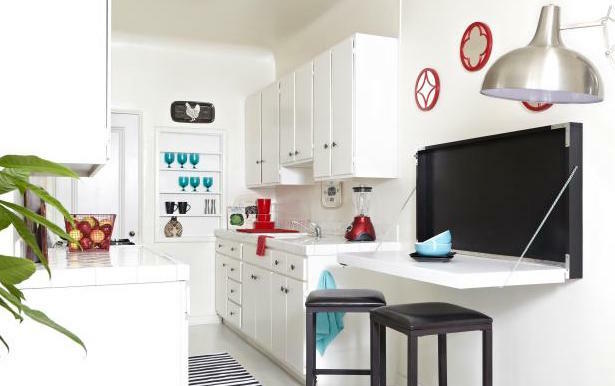 However, while compact living reduces the cost of maintenance and amenities such as electricity, it requires an increase in interior design creativity – from function to décor. Add to this the ongoing preference for hardworking open-plan living and personalised style, and the challenge to design practical small kitchens is real. The kitchen is often command-central of a home, a space that needs to meet the needs of all people living in the home. 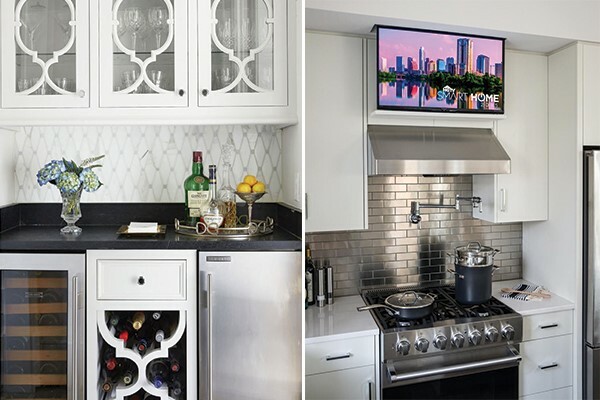 This is amplified in an apartment or smaller home where kitchens need to serve a multi-purpose role, including dining area, home office, entertainment area, indoor garden etc. Very few apartments have a designated dining room or area, and the kitchen is called upon to serve this purpose. 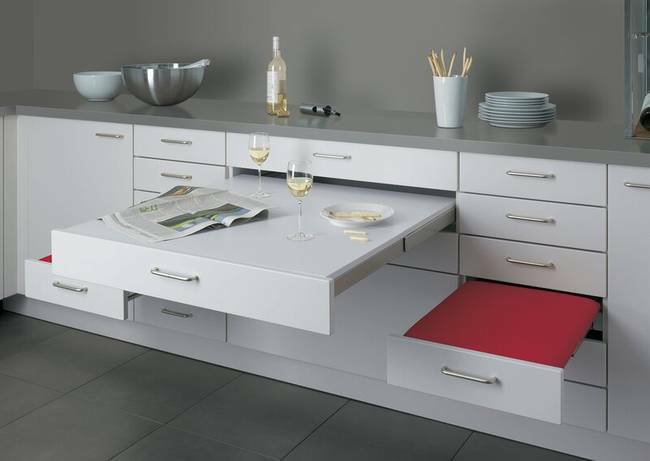 An alternative to the popular kitchen island or breakfast bar option, is either a slide-out or fold-out table solution. Or include some space-saver furniture that can be easily pushed aside or under counter space, or even better used for other purposes when not in use for dining. Smaller homes often do not have a second or third bedroom, or space available in the living area to accommodate a home office. However, a cleverly designed kitchen can incorporate a practical desk space within its fitted cabinetry, either at counter height or desk height. Be mindful that there may not be a lot of distance between this work space and food preparation and cooking so opt for practical materials that are easy to keep clean. Instead of upholstered chairs consider loose cushions or slip covers that can be removed during cooking, and are easily washed. Identify the space with some unique décor finishes – change the wall colour or wall finish behind the desk, or install a practical pin board or calendar. Remember to keep the area decluttered allowing it to be integrated into the working kitchen if needed. Open plan living can be challenging, especially when everyone wants to do something different in the same space. Having a second television in the kitchen may just save an argument when viewing preferences differ. Likewise, the kitchen bar can be a great adult escape from children’s cartoons in the living room. Under-counter bar fridge, wine rack and storage keeps this a subtle inclusion to the kitchen. One of the sacrifices of an apartment is often forgoing a private garden, but that is no excuse to not have greenery in the space. Indoor gardens can be incorporated in many ways from living walls to window features. Herbs are ideal because they are both practical and pretty. 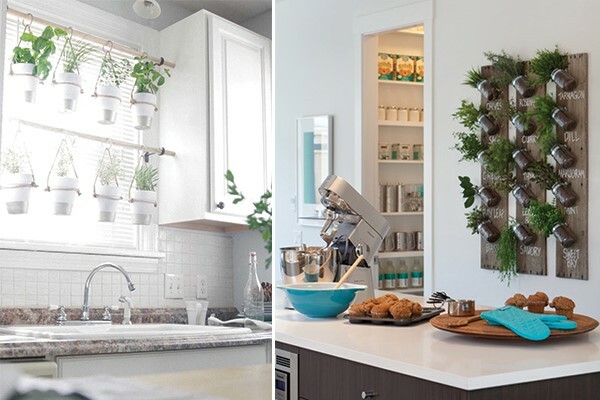 It goes without saying that no matter how creative you are, you need to invest in quality fixtures and finishes to make the most out of your multi-purpose kitchen. Look for reputable manufacturers and installers who are willing to consult and advise you on the best options, and custom make according to your unique requirements.